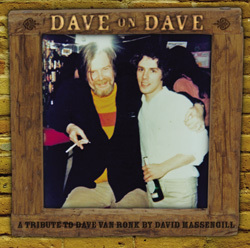 David Massengill "Dave On Dave"
Gadfly Records is proud to release "Dave On Dave," a tribute from wildly creative singer-songwriter David Massengill to his mentor, good friend, and life compadre, Dave Van Ronk. On this loving portrait, Massengill mixes up some his own songs along with some written by DVR and others that Van Ronk performed and clearly made his own. From start to finish, this CD captures the flavor of an artist who was truly one-of-a-kind -- conveyed by a talented and dear friend. songs, Brecht, Bob Dylan, Joni Mitchell, Tom Paxton, Leonard Cohen, Rev. Gary Davis, and hey one of mine too. . .
“Congratulations, you’re now a bad guitar player--”. I never felt so proud.